I had some spare time recently, so I spent some of that on the track plan for my Murrbahn project. I'm aiming to model a section of the Murrbahn from Waiblingen to Schwaebisch Hall - Hessental, specifically the section between Backnang and Gaildorf West in the early 1970's. I chose a compressed version of Murrhardt as my third town. There's a private branch line to Untergroeningen, too, again very compressed to include only the station area of Untergroeningen. This room won't be available for several years. 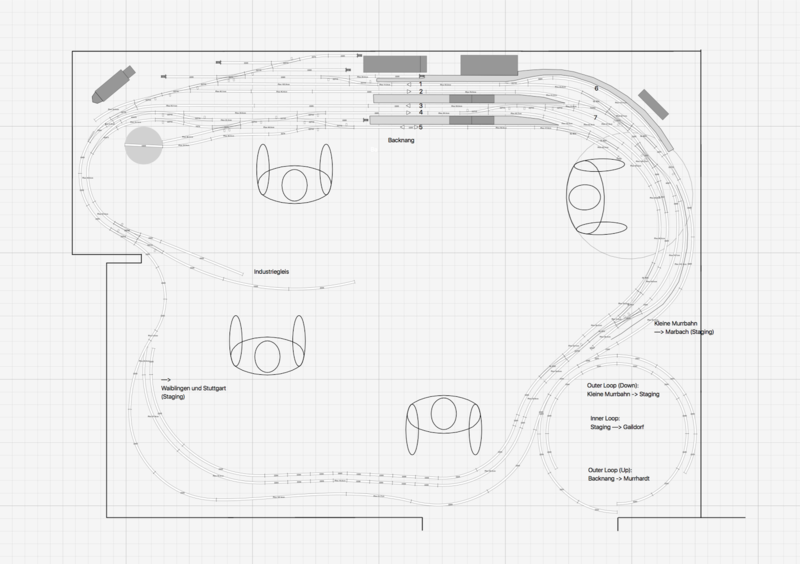 The point of doing the track plan now is to get an idea about layout design elements I could incorporate. How they would fit together and identify opportunities for layout segments and modules I might be able to build in advance of "the big project". I wrote some givens and druthers in an earlier post. The key constraints are minimum radius of 50cm (preferred 60cm or larger) on visible sections, and 42.3cm (standard radius on K-track turnouts) in hidden track or industrial. Maximum train length is 180cm (5x 26.4m coaches), and 200cm for freight (15-20 freight cars), including engine respectively. The screenshot above shows the main level with Backnang station. In the early seventies, my chosen time period, this station had a lot of interesting activity. Lots of local commute service. Head-end switching to adjust number of cars on passenger trains. This was the end of electrified territory, so trains usually had to change power from electrics to steam. Steam locomotives of classes 23, 38, and 50 were commonly seen here. Long distance trains from Stuttgart often used a class 220 or 221, the flag ship diesel engine of the modern DB. Freight trains carried bridge traffic from the Stuttgart area to northern Bavaria and beyond. Local transfer runs, as well as local freights made stops along the line, too. As it stands today, I have no idea how DB actually managed to run all the traffic they had through this station. There doesn't appear to be nearly enough track to do it all, especially when taking into account freight operations. This should be interesting to figure out. The prototype station is over a mile long between the first turnouts on either side, and sits on a hill side above the city of Backnang. On the West side, the electrified double-track main line to Waiblingen and Stuttgart, as well as the non-electrified branch to Marbach and Ludwigsburg ("Kleine Murrbahn") enter the station. On the East side the main line continues non-electrified and single-track to Schwaebisch Hall and Crailsheim. To better fit the room I flipped the original track plan (East is left), and bent the tracks along the room walls, a compromise that changes the feel of the station, but not the operations. 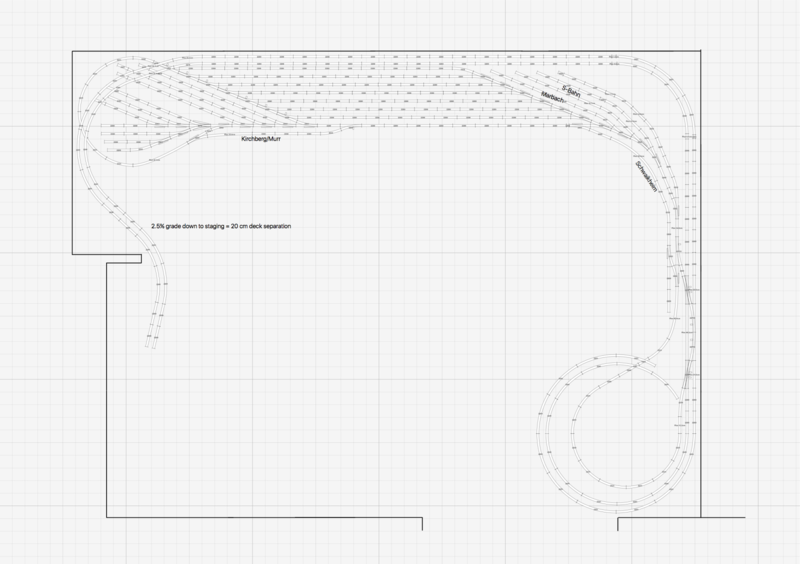 A nastier side effect of this is that I'm going to need a whole bunch of curved turnouts with radii that are not available in the Maerklin K-track system, so I either need to substitute DC turnouts and modify them, or scratch-build. I substantially reduced the length of the station, but managed to keep almost all track connections. As another nod to space constraints I moved loading docks and team tracks from near the turntable around the corner to a peninsula forming an industry track ("Industriegleis") supposedly owned by the city and serviced by DB. Backnang didn't have this, but this was a common arrangement in other cities. This industry track is not yet designed in the track plan. The main line curve on the left into the station has a minimum radius of 50cm, which is sharper than I'd like. I might end up going through the wall of this former closet to get a wider radius. Continuing through the station from the left, there are freight facilities towards the wall, and a steam locomotive waiting area with the turntable around the East end of track 5. These tracks used to have a coaling facility, too, but that was already gone by the early 70's. The passenger platforms on tracks 2 - 5 are 150cm, so they can barely take the maximum length passenger train. Track 1 is only 120cm, but that should be sufficient. Track 6 on the curve is where the push-pull trains from Marbach arrive and depart from. Track 7 is a waiting track for electrics to/from Stuttgart. Further around the bend are the electrified double-track main line, a couple storage tracks, and in a ditch along the wall the non-electrified branch to Marbach descending into the valley towards river Murr. The branch enters the helix counter-clockwise down to staging. The electrified double track main line crosses the room entrance on a removable section or swing door, continues around the room on a slight downhill grade and enters the tunnel to staging on the left-hand side of the room. All main tracks and many side tracks in Backnang have catenary. This will be a problem with switching within station limits in general, and especially reaching the freight tracks in the rear. From the East (left) end of Backnang station the single-track non-electrified main line to Schwaebisch Hall-Hessental runs counter-clockwise along the wall and starts climbing with a slight grade to cross the room entrance, and enter the helix clockwise upwards to the upper level. I might model Haltepunkt Backnang-Spinnerei just before entering the helix. On the upper level the main line emerges from the helix on the outer track and immediately passes the entry signal into Murrhardt. Murrhardt is a fairly free-form adaption of the name-sake town's station. I'm still not entirely happy with the arrangement here, but it's more manageable now. ... Or maybe I just got used to it. Compared to the earlier draft I swapped Schweitzer Leather, and the city gas works, as well as tweaked track arrangements. From here the main line continues to climb counter-clockwise around the room (East is still left as seen from operator's view.Yay!) through the Kappelesbergtunnel to Gaildorf West. Gaildorf West continues to be very similar to an earlier draft. Past the station, the main line enters the inside track of the helix all the way down to staging. On the West side of Gaildorf the branch operated by Wuerttembergische Eisenbahngesellschaft (weg) climbs to Untergroeningen. I eliminated the turnback loop from the first draft, since even as tight as it was, it didn't leave enough space for operators in Backnang and Gaildorf West. The Raiffeisen spur is non-prototypical, and I'm thinking about how to include an additional spur as destination for the wood chips cars this branch is well known for. On the prototype the wood chips cars went empty to a large sawmill in Unterrot, and were sent loaded to e.g. a paper mill in Schongau, Bavaria. I don't have the space to model the sawmill, but I might be able to squeeze in a spur "to the mill". Staging is centralized under Backnang. I'm aiming for vertical deck separation of at least 20cm between Staging and Backnang station, preferably a bit more if I can get away with it. There are 7 through tracks long enough to hold maximum length trains, as well as several stub tracks to hold push-pull equipment, EMUs, DMUs, spare locomotives and some spare cars. The double track main line from Backnang runs clockwise on a ramp along the wall to meet the two tracks from the helix (inner track from Gaildorf West, outer track "Kleine Murrbahn" vom Backnang). At the bottom of the ramp are crossovers to allow trains to enter staging. These turnouts will likely be very busy, so need to be built rock solid and be easy to replace as needed. A return loop inside the helix is used to get trains up and down the double-track ramp to Backnang in and out of staging. 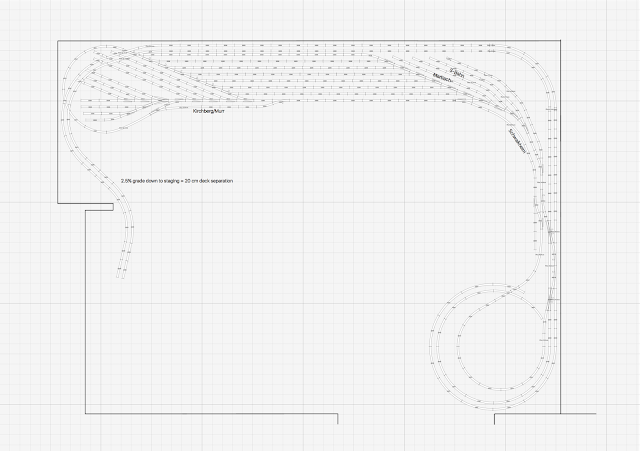 A second return loop in the top left corner allows to turn train sets in staging. Contrary to the Welztalbahn (my current layout), all trains can be restaged and cars reschuffled without leaving the staging area. In the worst case a train needs to pull to the track along the aisle and get its cars restaged as needed. I'm thinking of adding storage drawers under the staging level to make that more convenient. I'm planning to run transfers ("Uebergaben") from Backnang to the off-layout locations Schwaikheim on the mainline to Stuttgart and Kirchberg/Murr on the "Kleine Murrbahn" to Marbach. There are dedicated tracks close to the aisle for these places in staging. 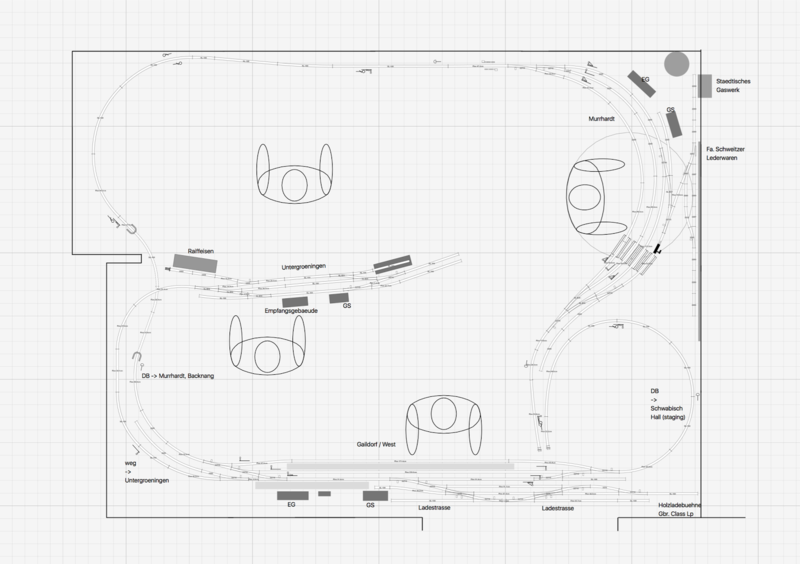 Staging feels too small for a layout of this size, so I'm likely going to try and find ways to add more through tracks to staging. However, I don't want an additional door crossing at staging level height so the trick will be finding an appropriate space for the second return loop. Since this is basically a large shelf-layout, I won't have much space for much scenery or extensive town scenes. I'm planning to make up for that with backdrops, high-quality scenic execution, and plenty of details. This layout should keep up to 6 guests busy for several hours. I'm planning for two tower operators, one in Backnang responsible for the main station, hostling, and head-end switching moves. A second one in Gaildorf West responsible for Gaildorf West (and maybe Murrhardt). There's even potential for a mole job responsible for smooth operation of the bottlenecks in staging, but I'm likely running into space constraints if I tried that. The tower operators are expected to coordinate train movements across the layout based on the schedule. There is no centralized dispatcher. Single person road crews run passenger and freight trains, as well as switching in layout towns. For single person switching operations, various jobs can be eliminated and a limited passenger / through freight schedule can be established with computer-controlled automated running to keep traffic up on the main line, similar to what I'm doing on the Welztalbahn. In terms of layout design elements I can build early: Untergroeningen and Gaildorf West are obvious victims, as well as the Industriegleis in Backnang. An updated track plan is now available.